they're amazing... I love your themes. Just scraps and batting, right? You'll put the backing on later once all the blocks are pieced together, right? Love these! Got to meet Penny/Sewtakeahike tonight at our modern quilt guild! We had fun talking about how great your quilts are! Looking forward to trying this--you make it look quick!!! I had this one ready to do, fabric waiting, I was so pleased to see you were making it- it looks like it is going to be a multi coloured spectacular! Lovely choices along the lines of fabrics. Hi! I love your blog and have passed on a blog award to you :) Thanks for the inspiration! These are so beautiful. I have to try the quilt as you go now! These are so gorgeous! Making me want to start one right now :-)!! Wow. these look amazing. Am researching books on the quilt as you go method as we speak. any recommendations? Beautiful! And they're addictive, aren't they! Wonderful! Love the fabric with the girl in your red block! i'm not really sure i understand and embrace the "quilt as you go" process. i'm sure it's much simpler when it comes to large quilts, but isn't it more time consuming to be quilting each block at a time? Simplesmente Maravilhoso!!!! Beatiful!! Très Jolie!!!! These look beautiful, Rita and I love the addition of illustrated fabrics, weaving a story through...going to STUNNING! Making this quilt is on my to do list! 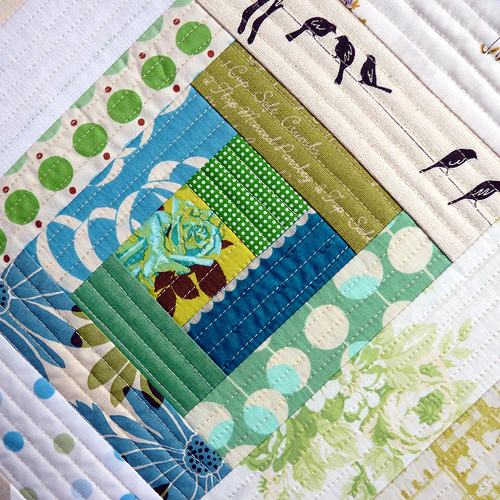 I just love the quilting. I can't wait to see it sewn together. I'm so in love with your work!! Great fabric choices. I can't wait until my stash extends to far more exciting - non kiddy fabrics so that I can try my hand at one of these too. Look forward to seeing the finished product. Looking forward to seeing this all finished. Right now it looks gorgeous! Absolutely gorgeous (as usual! 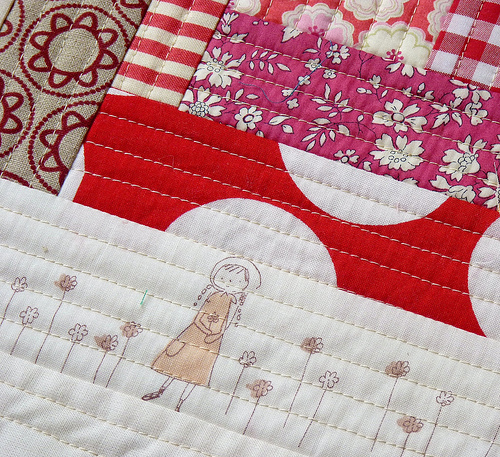 ); I love the fabric with the girl and flowers in the pink/red block, what is it? They are really outstanding and ypur fabric choices are wonderful. I love this so much! I can't wait to see it finished! I sure do wish I had the fabric stash you do, I could never accomplish this! love them all! how you put the fabric together is so sweet! thanks for sharing! You are doing a beautiful job with these! How fun! :) I love the little girl in the flowers on the pink/red one... is that still available or an older print? I agree with everyone, they are wonderful looking! These look like such fun. I need to clear the decks to try some of these! oh the blue is my favorite, with the beautiful mermaids!!! They are just perfect, Rita! Coming along beautifully, Rita! I'm inspired by your color combinations, as always. 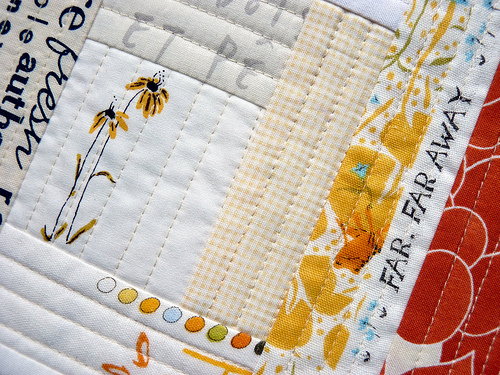 I really love the idea of the quilt as you go! I need to clear out my backlog of projects so I can start one. Your posts are inspiring as always! OMG! I love your blocks. Do you like doing it this way? or quilting after it's all together? I really need to try this. fabulous, just fabulous! It's funny isn't it....I have this book and I believe you do too Rita....but I would never have been brave enough to try it without reading through the tutorial and seeing how yours is coming together. Yay for tutorials and sharing! 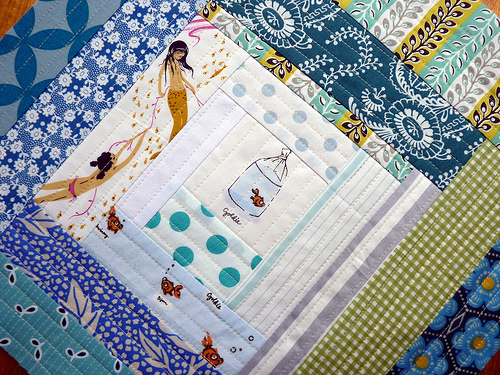 Very Inspiring...Love all the Fabric combo's..
oh the blue is just gorgeous, well of course they are all gorgeous but the blue and mermaid, gorgeous! Your blocks are just beautiful! I would like to try this way but I'm not sure about the backing. The Penny solution isn't so perfect... how do you think to do? very very nice blocks. Have to try this some day! I made two of these blocks last weekend. I love them, EXCEPT I also added the backing at the same time and they will be way too thick to sew together the way I had wanted to!! I think I'll have to turn them into large trivets or pillows and start again. I guess I was afraid to sew just onto the batting, thinking my machine would be full of lint in no time. Is that a problem for you, and what type of batting do you use? TIA!! I use 100% cotton batting for almost all of my quilting projects. I purchase batting with a scrim which makes it stronger and makes less mess with your sewing machine. Be sure to use the batting scrim down. Cotton batting is also quiet thin which is a look I prefer for my quilts. This is just my personal preference though. 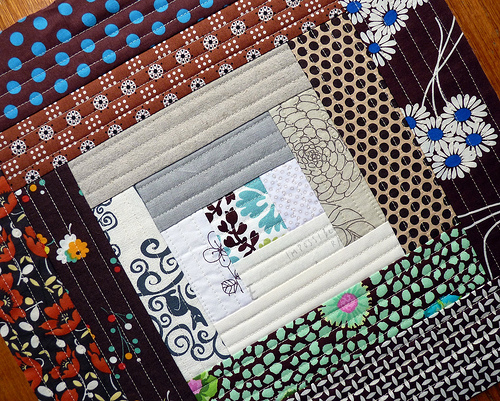 Thin batting is better for quilt as you go projects, as blocks will need to be sewn together, including the batting.